David Stern: The American Years (1995-2008) is a comprehensive examination of painter, David Stern’s work since his immigration to the United States in 1994. Karen Wilkin is the curator of this national traveling exhibition and primary author of the accompanying catalogue. The show is comprised of about 40 paintings and drawings by Stern, who was born (1956) and educated in Germany and who has lived in New York City since 1995. As Karen Wilkin has pointed out, “David Stern’s history as an artist encapsulates, in many ways, the wholly modern notion of the ‘artist without borders’ whose work reflects the multivalent experience of an increasingly globalized world.” His forceful and energetic canvases, covered in inches-thick layers of paint, convey the dizzying, exciting, and sometimes sinister experience of the modern metropolis. 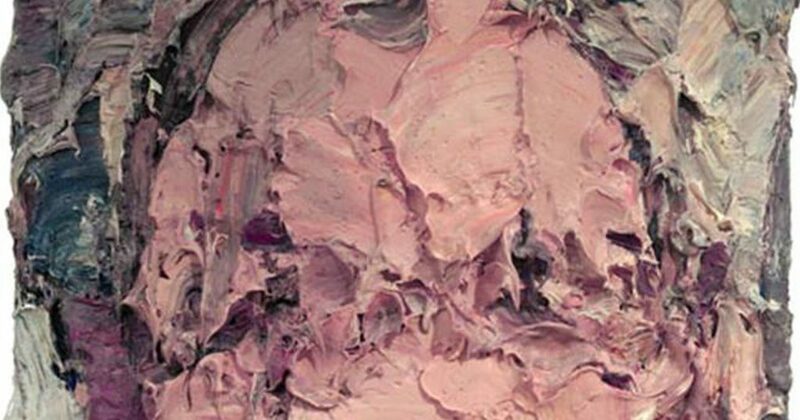 Stern has referred to himself as an “action painter,” echoing the artistic legacies of New York School painters Jackson Pollock, Willem de Kooning and Franz Kline. Yet his captivating human forms—by turns tragic, grotesque, and vulnerable—reach further back to histories of portraiture. David Stern was born in 1956 in Essen, Germany. He grew up as a single child, dropped out of a Catholic High School for boys at the age of 13, and began an apprenticeship as a sign painter. While an apprentice, he got his High School diploma in an external exam and finished his apprenticeship in 1972. From 1972 to 1975 he attended pre college classes in Essen and in 1975 he went to the Dortmund Fachhochschule für Design and Art, a studio school, where he studied painting and graphic techniques such as lithography and etching. Stern graduated from the school in 1980 and was accepted at the prestigious Düsseldorf Kunstakademie, where he stayed until 1982. He moved to a small village near the town of Muenster, to develop his painting skills and to find his own language in an inexpensive setting. In 1986, he moved on to Cologne, where he found his artistic voice. Stern met his wife Rachel and in 1989, after the death of his paternal grandfather, he returned to his Jewish roots. From 1987 on, Stern exhibited his work nationally and quickly entered the international scene in the early nineties, with shows in Austria, Hungary, the Netherlands, Belgium and Great Britain. After showing in the US for the first time in 1992, Stern prepared to immigrate to New York with his wife and two children. He immigrated in 1994 and became naturalized in 2000. Since 1995, Stern had nine one man shows in New York City and numerous shows nationally. “David Stern: The American Years (1995-2008),” which is curated by Karen Wilkin, will travel nationally until 2012. The events of September 11, 2001, deeply affected Stern and threw him off his beaten path, he left his downtown studio in 2003 and moved to Chelsea, where he continues to work today. Since his 2006 show in London, and his 2009 show in Berlin, Stern has enjoyed revived interest in his work in Europe.